Sheffield United manager Nigel Clough has revealed his team will wear black armbands during this afternoon’s match against Crawley Town as a mark of respect to one of the club’s most well-known supporters, writes James Shield. David Spencer, otherwise known as Shred, passed away as Bramall Lane’s first team squad prepared for its visit to the Checkatrade.com Stadium. And Clough told The Star: “It’s very sad news. He was one of our most loyal and unassuming supporters. Clough added: “A lot of supporters like recognition in some way shape or form but he wasn’t like that. United, fifth in the League One table with 15 games of the season remaining, could move to within seven points of the automatic promotion places if they dispatch Dean Saunders’ side. Despite languishing in the relegation zone, Crawley beat Championship hopefuls Swindon Town in midweek. United, who are unbeaten in five outings, could recall Jason Holt after the on-loan midfielder returned to training following an ankle injury. 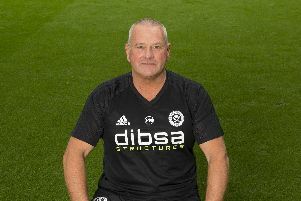 Centre-forward Marc McNulty will be assessed having been withdrawn during Tuesday’s victory over Rochdale with a shin complaint while goalkeeper Mark Howard remains a doubt. Clough said: “It’s not always as easy as it sounds but we’ve got to keep same desire and determination we have in last few weeks.